The 10x25 Trend Monocular from Barska is an eye opener. 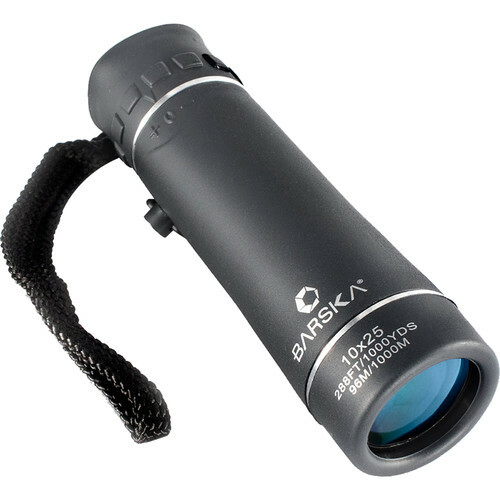 Who says monoculars have to look like a short, fat stogie? Clad in black rubber armoring with silver accents, this compact optic has a sleek, contemporary look you'll be proud of when traveling or taking in a concert or sporting event. The Trend delivers a good all-around magnification level of 10x, with a generous 25mm objective lens gathering plenty of light for a sharp, bright image. It comes with a carrying case, neck strap, and lens cloth. Box Dimensions (LxWxH) 5.6 x 2.1 x 2.1"